What are the most popular online degrees? We celebrate Valentine’s Day by highlighting the online degrees you love! Online college is on a winning streak. At a time when enrollment for traditional college is flat-lining, the number of students taking online courses continues to rise. According to Inside Higher Ed,the number of undergraduate students who were enrolled in at least one distance education course in 2016 had risen from 27.1 to 30 percent in just two years. Graduate students saw a rise from 32.5 to 36.6 percent during the same period. So what’s behind this pattern of growth? It must be love! …. and convenience, flexibility, accessibility, affordability, and a whole lot of other factors. But love is a factor too. I mean, there are certain online degree programs that you just seem to love. In the spirit of the season, we’re highlighting the most popular online degree programs, and of course, we’ve got killer online college rankings to go with each program. Read on to find out which online degrees are winning the popularity contest these days. And just a side-note from somebody who’s been there…. do not to overdose on those chalky gelatinous Luv hearts that come by bags of a zillion. Those things just aren’t right. Anyway…. Happy Valentine’s Day! Alright, we get it. You love online college. But which programs do you love the most? ThoughtCo. reports on findings from a study conducted jointly by Learning House and Aslanian. They identify the most popular degrees in online education. Online business administration tops the list of popular degrees and it’s no wonder. This discipline covers a lot of ground, including business theory, organizational management, economics, marketing, human resources and a host of other interrelated subject areas. This is a great degree program whether you’re going into sales, starting your own business, looking for ways to advance inside a large corporation, or you simply have an entrepreneurial spirit and you’re looking for the best way to channel it. A degree in business administration will give you a well-rounded foundation in business, and could help you identify a more specific area of focus as you advance to the graduate level. Most regionally accredited colleges and universities offer business administration degrees, and online business administration degree programs are widely available. As you advance in your degree program, you’ll have the opportunity to choose courses with increasingly specialized focus. From consumer goods, food services, and hospitality to real estate, apparel, production and everything in between, a degree in business gives you the tools and qualifications to mold the career you envision for yourself. For an idea of what you can do with a degree in business administration, and how much you can earn doing it, check out the following data from the Bureau of Labor Statistics. The BLS notes that the median annual salary for careers in business and finance in 2017 was $67,710, significantly higher than the median annual wage for all occupations of $37,690. The BLS identifies common careers for business administration degree holders, as well as median annual salaries for 2017, among them Accounting and Auditing ($69,350); Human Resources ($60,350); and Personal Financial Advisors ($90,640). Online computer science degrees are extremely popular, and a glance at some of the earning potential in this field leaves little mystery as to why. Computing technology has permeated every aspect of our lives, from basic services and retail to transportation, healthcare and event attendance. This accounts for an enormous and diverse array of professional opportunities. Computer science can be a highly challenging field, but if you have patience, precision, and a sharp eye, there are a lot of educational options that can help you get your career off the ground. Computer programming, computer science, and information technology (IT) form a wide and overlapping set of disciplines as well as an enormous range of fast-growing and well-paying professional opportunities. For an idea of what you can do with an online degree in computer science, and how much you can earn doing it, check out the following data from the Bureau of Labor Statistics (BLS). The BLS indicates that in general, the median annual wage for computer and information technology occupations was $84,580 in 2017, significantly higher than the median annual wage for all occupations. The BLS also identified some noteworthy career paths for individuals with a degree in computer science, including Computer and Information Research Scientists ($114,520); Computer Programmers ($82,240); and Web Developers ($67,990). Online nursing degrees rank a healthy third on the list of popular online degrees. There’s a reason students love this field. As the healthcare sector continues to grow, the opportunities available to individuals with a nursing education continue to diversify. And of course, this is a great educational path for big-hearted individuals. As a nursing professional, you’ll be in a position to bring comfort, relief, and wellness to others. In all likelihood, you’ll even save some lives. Nursing is a demanding profession but if you have compassion, emotional fortitude and an innate desire to help others, it could be the most rewarding way to apply your abilities. Whether you plan to work in a small family medical practice, in the emergency room of a big urban hospital, or as a nursing administrator in a multi-facility health network; whether you plan to practice general medicine, to specialize in a particular area of treatment, or to become a nurse practitioner, there is a degree path that best suits your needs. For an idea of what you can do with a degree in nursing and healthcare, and how much you can earn doing it, check out the following data from the Bureau of Labor Statistics (BLS). The BLS indicates that Registered Nurses earned a median annual salary of $70,000 in 2017. The BLS also identifies some noteworthy career paths, and related median salaries, for individuals with online degrees in nursing and related healthcare concentrations. Among them, the BLS identifies Health Educators and Community Health Workers ($45,360); Licensed Practical and Licensed Vocational Nurses ($45,030); Medical Assistants ($32,480); Nurse Anesthetists, Nurse Midwives, and Nurse Practitioners ($110,930). Online engineering degrees are growing in popularity, which is good news, because there is a tremendous demand for talented, qualified individuals in an array of engineering fields. Engineering concerns the research, design and use of machines, engines and structures. It is not an exaggeration to say that the work of engineering professionals permeates every part of our lives, from the cars we drive and the houses we live in to the smartphones in our pockets and the medical technology that improves our life expectancy. Engineering is a challenging academic field, and in order to obtain a license as a Professional Engineer (PE), you will likely need to earn a master’s degree in this field. However, a growing number of regionally accredited online colleges and universities are offering advanced degrees in engineering online. At the end of your studies, your hard work will be rewarded with great job prospects and strong earning potential, not to mention a tremendously valuable skill-set. According to the Bureau of Labor Statistics (BLS), individuals in engineering fields earned a median salary of $91,000 in 2016. This suggests that an engineering degree could offer a fairly high return on investment, even given the graduate degree requirements for certain positions. The BLS identifies a few noteworthy career paths that you could pursue with an online degree in engineering, as well as their median annual wages in 2016, including Civil Engineers ($83,540); Mechanical Engineers ($84,190); Aerospace Engineers ($109,650); Petroleum Engineers ($128,230); and Electrical Engineers ($94,210). An online degree in Early Childhood Education could be a great point of entry into the wide field of education, as well as a way to make an immediate impact on the lives of children at their most formative learning stages. It is the latter of these two opportunities that almost certainly accounts for the popularity of online early childhood education degrees. There is perhaps no better professional path to positively shaping the lives of children or assuring a brighter future for our world. An online degree in early childhood education is a great starting point whether you ultimately see yourself working with vulnerable student populations, serving as principal to a high-performing middle school, working with special needs learners, or training as a guidance counselor; whether your passion draws you to science, physical education, literature or the nearly infinite array of subjects that you could ultimately teach. According to the Bureau of Labor Statistics (BLS), individuals in Education, Training, and Library Occupations earned a median salary of $48,740 in 2017. Online Art & Design degrees are particularly popular today. Companies are seeking ways to stand out in a changing print medium and produce visual innovation in the fast-evolving web and mobile spheres. This means that talented Art & Design majors are in high demand. An online degree in Art & Design can be a highly practical credential in today’s job market. Depending on your area of concentration, you could find work as a graphic designer, illustrator, print-maker, or photographer, to name just a few of many options. Art & Design is also a uniquely personal course of study, one in which you will be developing your very own portfolio of work. Contrary to any number of other degree programs, here, you will truly have a chance to express yourself. As you advance in your degree, you’ll also have the chance to focus on the areas or art and design that interest you most and make the most of your talents. According to the Bureau of Labor Statistics (BLS), individuals in Arts & Design fields earned a median salary of $45,250 in 2017. The BLS identifies a few noteworthy career paths that you could pursue with an online degree in Arts & Design, as well as their median annual wages in 2017, including Advertising, Promotions, and Marketing Managers ($129,380); Art Directors ($92,500); Archivists, Curators, and Museum workers ($47,360); Graphic Designers ($48,700); and Multimedia Artists and Animators ($70,530). What Can I Do With a Degree in Art & Design? Online information technology degrees share a lot in common with computer science degrees, and will likely include some areas of overlap. These may even be part of a common program for some colleges and universities. However, an information technology degree program will offer a great focus on systems analysis, information security, database management, informatics, and a host of other areas where data, technology and user applications coincide. For an idea of what you can do with an online degree in information technology, and how much you can earn doing it, check out the following data from the Bureau of Labor Statistics (BLS). The BLS indicates that in general, the median annual wage for computer and information technology occupations was $84,580 in 2017, significantly higher than the median annual wage for all occupations, which the BLS placed at $37,690. Among the occupations noted by the BLS are Computer and Information Systems Analyst ($88,270); Information Security Analyst ($95,510); and Database Administrator ($87,020). The online social work degree is among the most popular online college offerings because it provides a strong pathway into a career helping others. From addiction support, family therapy, and youth counseling to health education, corrections and community service, your social work degree could give you the opportunity to spend every day improving opportunities for those in need. If your compassion is as great as your ambition, social work might be the field for you. If you’re seeking a career in social work, prepare for a challenging but rewarding experience. As a social work professional, you’ll have a chance to make a positive and even life-altering impact on the people around you. Often, you’ll work with people enduring struggles and challenges. This might include individuals experiencing mental health or medical crises, children who have been orphaned or fostered, individuals who have been subjected to abuse, individuals battling chemical dependency, reformed inmates transitioning back to the free world, dysfunctional families seeking guidance, or a host of others navigating difficulty or hardship. There are a lot of possibilities in this field. As you advance in your studies, you’ll get a greater sense of the areas where you’d like to focus your energies and concentration. According to the Bureau of Labor Statistics (BLS), individuals in Community and Social Services fields earned a median salary of $43,840 in 2017. The BLS identifies a few noteworthy career paths that you could pursue with an online degree in social work, as well as their median annual wages in 2017, including Community Health Workers ($45,360); Marriage & Family Therapists ($48,790); School Counselors ($55,410); Social Workers ($47,980); and Substance Abuse Counselors ($43,300). Online liberal arts degrees are popular for one pretty obvious reason: flexibility. The Liberal Arts degree is whatever you want it to be. This is a major that will typically pair your chosen area of academic focus (be it a Bachelor of Arts Degree in psychology, social work, human resources, communications, business administration, mathematics, or a host of other fields) with a varied selection of electives and humanities courses. This means that you’ll have a chance to learn within a chosen field while building an education that is colored by a selection of unique and interesting courses of your choosing. These will likely run the gamut of literature, history, culture, and arts courses. And because a great many employers prize versatility and unique bodies of knowledge, this type of academic variety could serve you well in pursuit of professional opportunity. For an idea of what you can do with a degree in liberal arts, and how much you can earn doing it, check out the following data from the Bureau of Labor Statistics (BLS). The BLS identifies common careers for liberal arts degree holders, as well as their median annual salaries for 2017, including Economists ($102,490); Geographers ($76,860); Mathematicians ($84,760); Political scientists ($115,110); Public relations specialists; and Writers & authors ($61,820). Online Degrees in Healthcare Administration round out the list of most popular online college degrees, and it’s a good thing they do, because the demand for qualified individuals in this increasingly complex field continues to grow. Healthcare administration is proof that you can save lives in the medical field without becoming a doctor or nurse. Healthcare is a complex, varied and rapidly growing sector, which means there are all kinds of professional opportunities related to delivering service, treatment, support, and access to patients and participants. If you see yourself working on the business side of medicine, this is the degree path for you. This course of study will prepare you to work in areas like operations, finances, and human resources for hospitals, clinics, and a host of other healthcare environments. One of the big draws to a job in healthcare is the chance it gives you to help others. It doesn’t hurt, of course, that this is also one of the fastest-growing and best-paying job fields out there. Healthcare administration is an excellent path if you have a heart for helping others and a mind for business. According to the Bureau of Labor Statistics (BLS), individuals serving in Medical and Health Services Manager roles earned a median salary of $98,350 in 2017. This means that while healthcare administration rounds out our list of 10 online degree programs, it offers the highest median salary. This is particularly worthy of consideration because it is a field you can enter with a bachelor’s degree. That noted, the BLS indicates master’s degrees are increasingly commonplace in the field, which means that an advanced degree could make you a more competitive candidate. The BLS identifies a few noteworthy career paths that you could pursue with an online degree in Medical and Health Services Management, as well as their Median annual wages in 2017, including Administrative Services Managers ($94,020); Human Resources Managers ($110,120); Insurance Underwriters ($69,760); and Social and Community Service Managers ($64,100). For those of you who made it to the end of our list, we have a Valentine’s Day treat. It’s not quite a heart-shaped box of chocolates, but it’s pretty sweet. Read on to learn a little more about the History of Valentine’s Day, and score a few free Spotify mixes. We’ve got two soundtracks for you: one for spending the holiday in the arms of a loved one; and one for spending the day wrapped in a shroud of your own solitude (or a Snuggie, which is kinda the same thing). 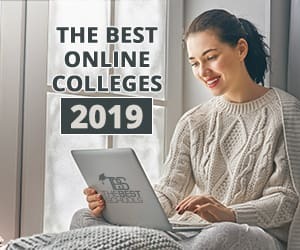 And if like us, your one true love is online college, jump to this year’s brand new master ranking of The Best Online Colleges for 2019.